My grandmother is pretty good at creating wreaths, swags, and other Christmas arrangements with the shrubbery in her garden. Actually, she is great at her craft. Over the years I have been able to observe the plants that she uses in her designs. It is quite remarkable what can be created out of many of our popular landscape plants. She uses plants that are not only pretty, but will also last for several weeks without turning brown or shriveling up into nothing. Jo Ann combines both conifers and broad leaved evergreens to diversify her pieces. By using these plants, my grandmother transforms an ordinary wreath into a one of a kind holiday beauty. I would like to mention first that Jo Ann primarily uses fraser fir for the backing of wreaths and swags. 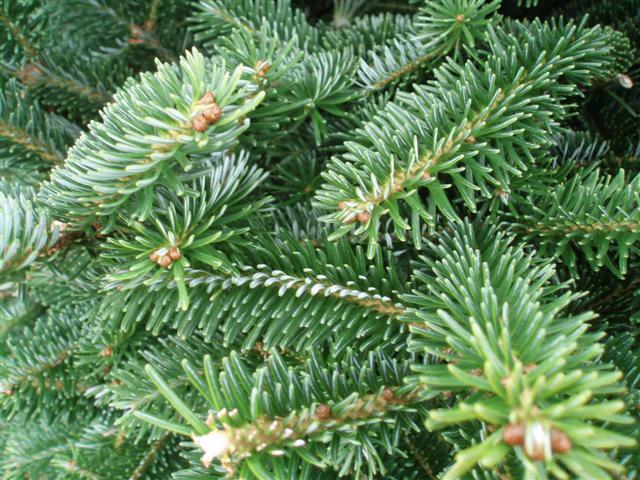 Fraser fir (Abies fraseri) is the most popular tree grown and sold in North Carolina for Christmas trees. While it is a very popular tree for its use in the home, I can not recommend buying and planting a liver fraser fir here in the piedmont. This species of fir is susceptible to root rot which in our heavy soils can be hard to avoid. The heat and humidity can also be a challenge for these plants. To find fir for use around the home, look no further than your Christmas tree (if you use a live tree). The trimmings from the base of your tree can be perfect as the base of any wreath, swag or centerpiece. The popular southern magnolia (Magnolia grandiflora) is a popular choice around the holiday season. The shiny dark green leaves with a velvety brown backing mix well with many other plants. Jo Ann also uses the large seed pods which often include red berries in her creations. She creates entire wreaths made of magnolia or just uses pieces to accent in others. The cultivar ‘Little Gem’ may be best suited for use due to the smaller leaf size when compared to larger cultivars. Crippsii cypress (Chamaecyparis obtusa ‘Crippsii’) is a columnar shaped conifer that can attain heights of 15 feet and widths of 6 feet in the landscape. Crippsii is not just an upright green blob. 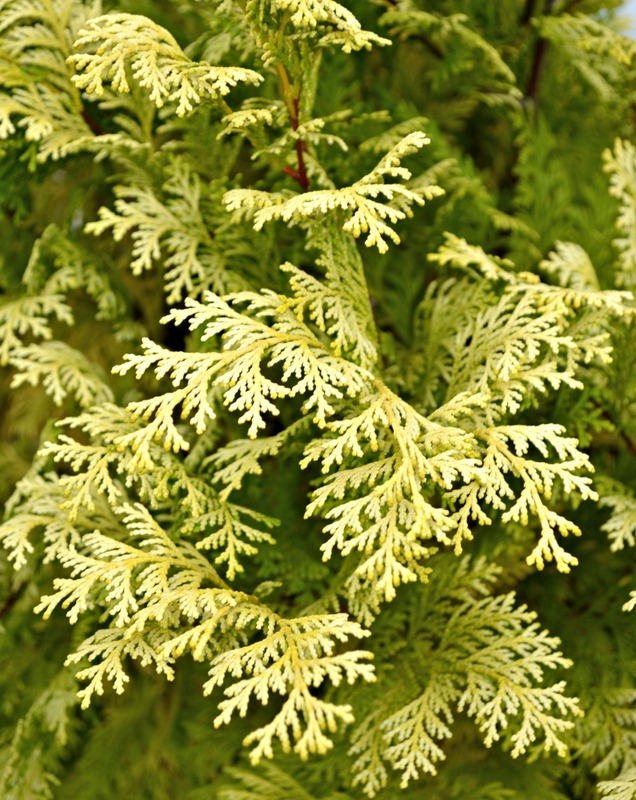 It includes brilliant shades of green and yellow in its fan shaped foliage. The colors and texture of Crippsii cypress combine beautifully with fraser fir and broad leaf evergreen shrubs. Jo Ann uses this plant to brighten the background of her arrangements. Holly (Ilex sp.) is one our most popular holiday plants as well as landscape shrubs. There are a litany of different species and cultivars available with nearly as many uses in the garden. Large leaves, small leaves, variegated foliage, or no foliage, berries, or no berries, all types can work. 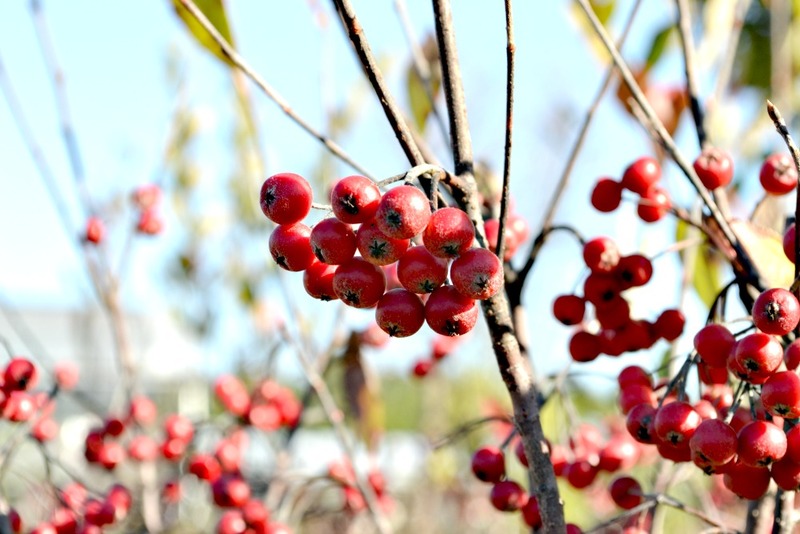 Both the foliage and berries are easily recognizable in candle rings and other decorations. Jo Ann uses everything from evergreen holly with its large thorny leaves to deciduous holly for its naked stems and berries. ‘Goshiki’ osmanthus (Osmanthus heterophyllus ‘Goshiki’) is a plant with a leaf very similar to that of a holly. ‘Goshiki’ is a neat little shrub in the landscape with a size of about five feet tall and wide. The cool thing about Goshiki is its variegation of the foliage. Goshiki actually means “five colors” in Japanese. 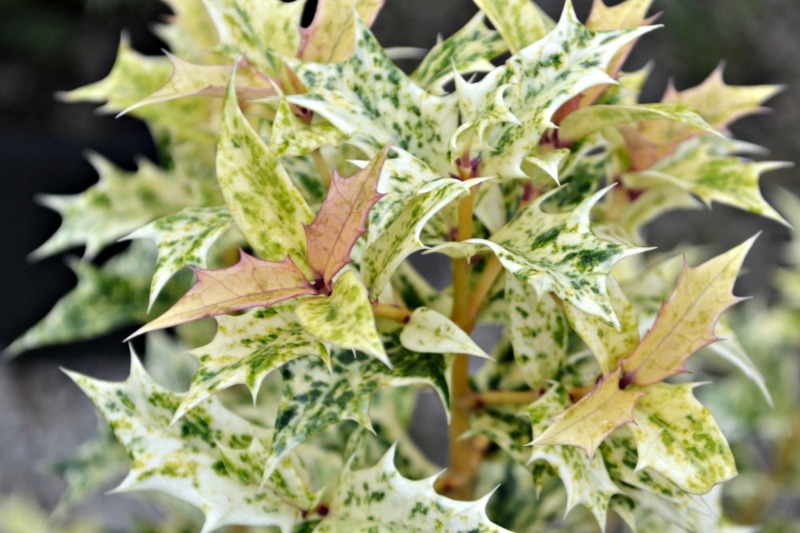 Several shades of green, white, cream, and pink make up the variegation in the leaves. This is another plant that really brightens up holiday displays. If blue is a color you would like in your Christmas decorations, try Carolinasapphire or blue ice cypress (Cupressus arizonica ‘Carolina Sapphire’ and ‘Blue Ice’). Both of these cultivars ofArizona cypress are columnar conifers in the landscape with ice blue foliage. The difference between the two would be the texture with ‘Blue Ice’ being a little coarser than ‘Carolina Sapphire’. While blue is not necessarily a traditional color of the Christmas season, small accents of these two plants can really help a wreath “pop”. Arizona cypress combines well with the variegated foliage of ‘Goshiki’ osmanthus and ‘Crippsii’ cypress. Nandina is another plant that Jo Ann uses in some of her arrangements. The fine textured foliage with colors from green to red and red or white berries can be a nice addition. She does not use this quite as often because of the potential of the berries falling off and the foliage possibly drying out early in the season. What about mistletoe? Mistletoe is actually a parasitic plant that grows in and amongst host plants. You can easily see mistletoe in the fall and winter seasons when foliage has fallen from oaks and other deciduous trees. Mistletoe will be the clumps of green foliage that look out of place during this time. Mistletoe can not actually be grown for the purpose of using it in arrangements. It has to be cut out, or many times shot down from its host plant. Mistletoe actually dries out pretty quickly so the good old fashioned plastic pieces may be better used in the home. Portions of plants will dry out in arrangements for obvious reasons. Jo Ann uses a product called Wilt Pruf to prevent this drying from happening too quickly. Wilt Pruf is an anti-transpirant which prevents the rapid release of water from plant tissue. This does not mean that fresh cut arrangements will last for months, but usually ensures that your holiday decorations will be fresh for three to five weeks. The wreath that my wife and I used last season lasted from the weekend after thanksgiving through new years and could have gone longer. The berries of some of the hollies had to be removed earlier but the foliage looked fantastic when we took it down. A couple of things to remember to keep wreaths, swags, and other arrangements fresh are to avoid warm or bright areas. Southern facing doors with no protection from afternoon sun will dry out wreaths quickly. Areas above fireplaces and under or over heat vents can also be detrimental to the longevity of arrangements. If you do not already have some of these plants in your garden, they can be easily added with the idea of using them in your holiday arrangements. Take some tips from my grandmother Jo Ann; use some of these plants to make your holiday truly unique!